Investigators examine luggage believed to have been abandoned on a street near where the bombing occurred on Monday. (CNN) -- An explosion that ripped through a Uganda-bound bus in Kenya on Monday killed one person and injured 26 others, a Kenyan police spokesman said, crediting security guards with potentially preventing more deaths. The guards confronted six people who seemed to be ordinary passengers as they tried to board the bus about 7 p.m. in Nairobi, Kenyan national police spokesman Eric Kiraithe said. The passengers resisted the guards' attempt to examine their luggage. As the altercation heated up, the assailants dropped their bags and ran away -- and soon after, some of the luggage exploded, according to Kiraithe. 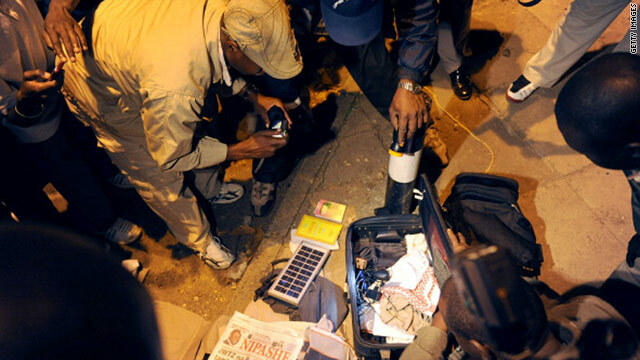 Kenyan police said that no one has claimed responsibility for the attack, nor do they know the motive. Kiraithe said the blast was most likely caused by a grenade or improvised explosive device, though investigators are still working to get more details. The bus was owned by Kampala Coach, a passenger and delivery company named after Uganda's largest and capital city. Kiraithe said Kenyans and Ugandans frequently travel between the two countries on business.